HOUSTON, Texas–The United States Supreme Court has denied the Application to Vacate the Stay filed by Texas Voter ID opponents. 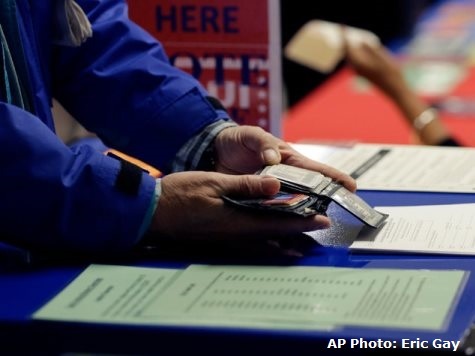 Senate Bill 14 Texas Voter ID requirements will be used in the November election. Justices Sotomayor, Ginsburg, and Kagan dissented. Greg Abbott, the Texas Attorney General, vows to continue to fight this battle in the courts. Application to Vacate the Stay the order that was issued by the U.S. Court of Appeals for the Fifth Circuit. Breitbart Texas reported that the Fifth Circuit had acted quickly to unanimously rule in favor of Texas by staying the decision of Judge Nelva Gonzalez Ramos, an Obama appointee sitting in the Corpus Christi Division of the U.S. District Courts for the Southern District of Texas. Ramos issued a permanent injunction on October 11th requiring Texas to enforce the in-person voter identification requirements that existed before Senate Bill 14 became the law. Ramos had ruled in a 147 page opinion that the law was an unconstitutional poll tax and discriminated against minorities. An appeal on the merits of Judge Ramos’ ruling will be decided later, but for now, her order and decision finding the photo ID law is unconstitutional is stayed. Lana Shadwick is a contributing writer and legal analyst for Breitbart Texas. Follow her @LanaShadwick2.